Yes. Mehtap Lokantası. It’s been around for some years, just sitting on the corner of the main junction in Çalış. We’ve never seen it packed, despite its large area and number of covers, but customers do come and go…and we come and go, too, very occasionally. There’s no reason why we don’t go there more often. It’s just one of those places that we keep forgetting about, and we shouldn’t keep forgetting about it because the food is perfectly good. Even on this last occasion when we went – a few weeks ago – it was by accident. We were en route elsewhere. ‘Elsewhere’ is a much smaller place and it was full with people eating lunch so, as we stood by the traffic lights, debating which direction to go in, it was a snap decision. We could have ordered a dürum at Mehtap. We could have ordered ekmek at Mehtap. They do all the usual snacky kebabs, and they do soups, too. But no. We saw the menu and that was that. 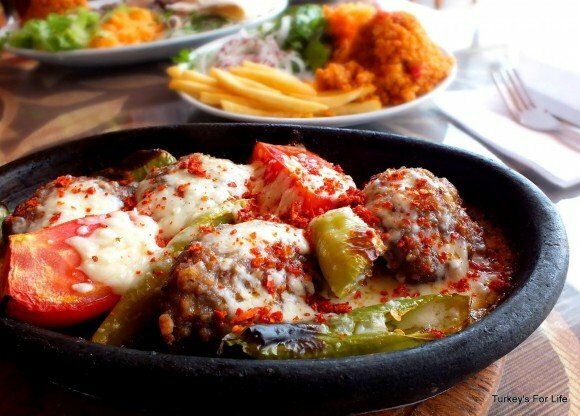 Köfte güveç was my order. It was a gamble because sometimes I don’t like köfte when it’s casseroled. Its texture changes and sometimes it’s not to my liking, but this güveç was just how I like it. The köfte was fresh and light. The güveç wasn’t too oily and the cheese wasn’t completely smothering everything and overpowering the dish. It was all just simple and freshly cooked. That on its own should have been enough for lunch – but this köfte güveç was also served with a generous portion of bulgur pilav, fries and a simple salad of lettuce, grated carrot and sumac-covered sliced onion. Yes, we do love our real chips but we can forgive this small portion of fries because the bulgur wheat was so tasty. 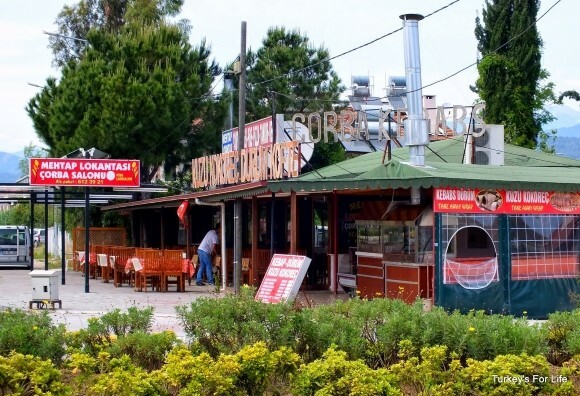 Because it’s a lokanta rather than a restaurant, Mehtap Lokantası is very reasonably priced. As well as full sit down meals, they also serve soups, dürüm, pide and pizza. 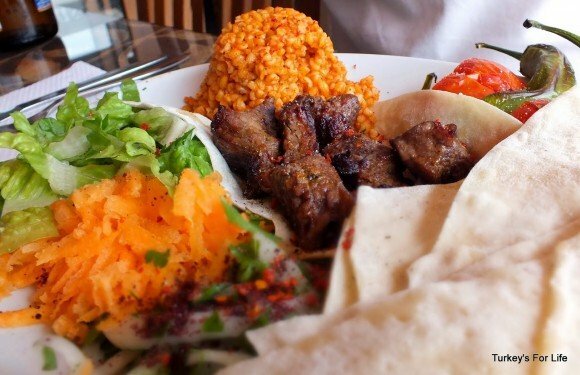 The menu is varied with lots of Turkish food on offer. Mehtap is open all year. The lokanta is on the corner of the main junction in Çalış where Barış Manço Bulvarı runs to the beach. You can see it here on our map of Fethiye. For other ideas of where to eat and drink in the Fethiye area, you can visit our Fethiye Eating & Drinking page.